We provide timely, accurate, and sensitive aerial survey elevations with astounding speed and accuracy. Our experience in the mining, construction, engineering, and landfill industries means that we can deliver the results you need. Drones are quickly replacing antiquated methods of keeping track of your inventory. 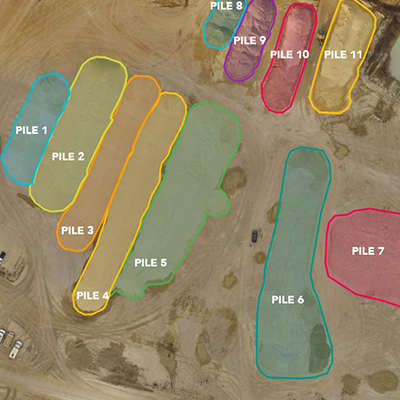 txDroneCo services industry leaders in their inventory counts and provides an aerial view of the site month after month. When working on a new site or existing, your team needs to know how much fill to bring in or take out. Maybe you need to accurately measure a surface over time. Our ability to fly the same mission again and again provides you with reliable and accurate data faster than ever. txDroneCo can provide contour lines based on photogrammetry from drones. 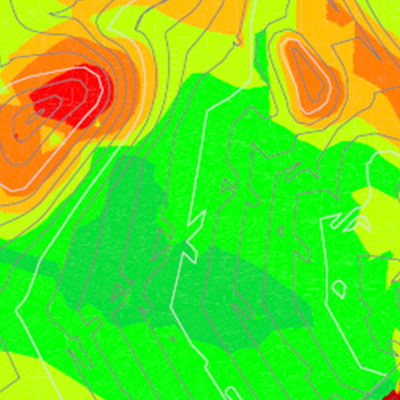 Why hire an expensive surveyor to know what kind of terrain you're dealing with? With a quick flight and our industry-leading processing, txDroneco delivers relevant contour lines and topo-view. Utilizing a Trimble R8s GNSS receiver and a TSC3 data collector, we set pins and aerial targets that are view-able from as high as 400'. Our drones then capture imagery and the points are identified in software thus "tying down" the ortho-map we generate to the surface of the earth. Most sites only require 4-8 GCPs for accurate mapping. This highly accurate point-cloud can be manipulated in a variety of software platforms allowing your entire team to see the site as it currently is. With the use of multiple flights at each site over time, your surfaces are compared for precise changes and site progress. When should drones be used? Texas Drone Company can provide timely and accurate aerial elevations when your project needs to get off the ground. While drones are able to capture data-rich point clouds with extreme density, surveyors and engineers alike simply don't need the large data-sets found in a typical point cloud. We can deliver CAD-compatible topographic data that you can immediately be brought into your software for break-line analysis and more. *txDroneCo is not a licensed surveyor in the state of Texas. We don't make any claims as to the definite boundaries of property.